Happy Friday! This should be an interesting weekend for me. I am babysitting my BFF’s 4 year old daughter for the full weekend! I have watched her before for a few hours, but this is the longest and hopefully I will survive. HA! If I survive, I am heading to San Antonio for a few days next week to visit my ZTA little sister. I am so excited for this trip! 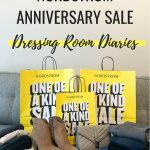 We both share a love for shopping, Nordstrom, and wine. I’m hoping tacos and margaritas on the Riverwalk will also happen. 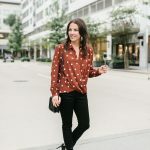 I’m starting my fall outfit inspiration with one of my favorite outfits I have shot so far for fall. 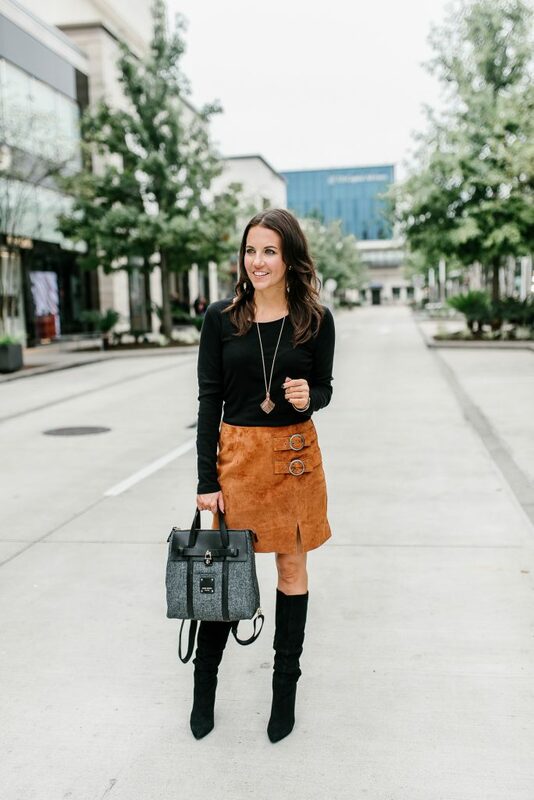 I have been skirt obsessed since spring, so this hot fall trend of a mini suede skirt aligns perfectly with my style right now. I’m warning you I will probably buy more. 🙂 I love the color on this one, so perfect and beautiful for fall. 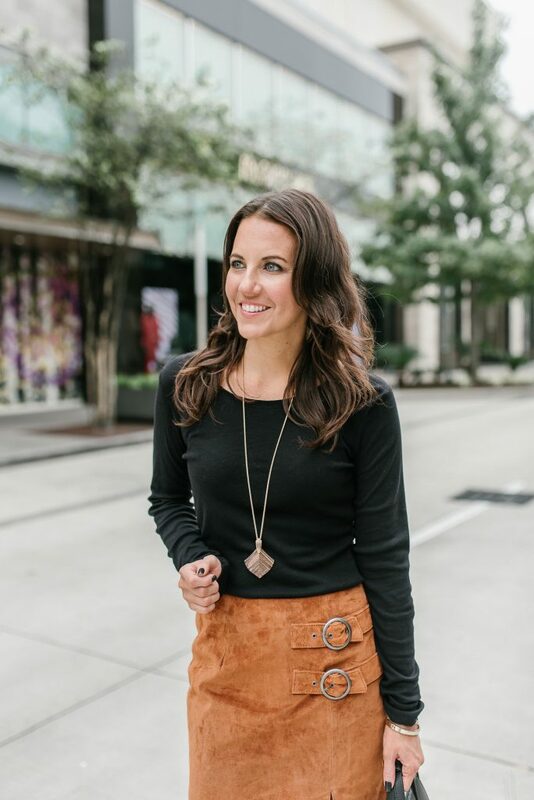 The buckle details and front slit help make this one stand out a little from all the other suede skirts. I love that I can pair it with something as simple as a basic black tee, and it still looks fabulous. 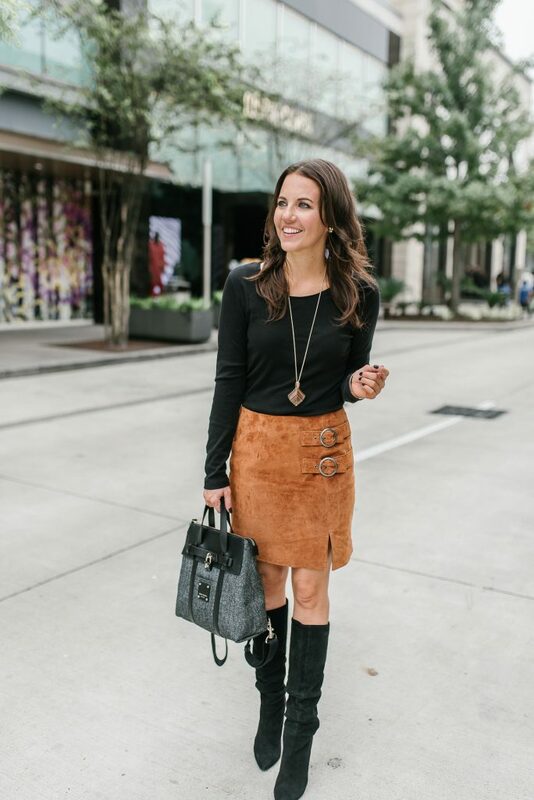 I love pairing mini skirts with boots. 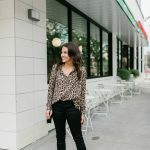 These slouchy black boots from last season work perfectly with this outfit. You can also do heels to show a little more leg. Also, ya’ll this necklace is so gorgeous!! It has the prettiest rose gold shimmer. While I think my photog did a perfect job of capturing it’s beauty, it is even more gorgeous in person! It looks so good against black, white, and fall jewel tones like burgundy, violet, and dark green. I hope ya’ll have a fabulous weekend! Thanks so much for stopping by this week! 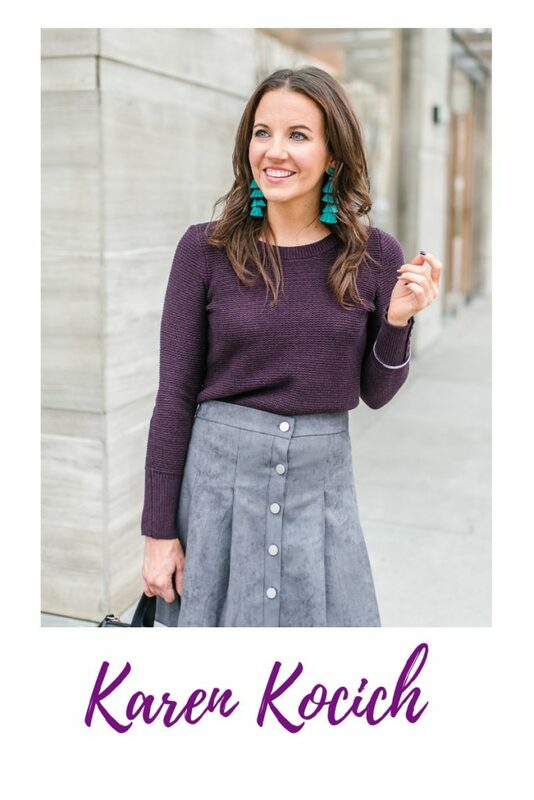 You look fabulous in this skirt! 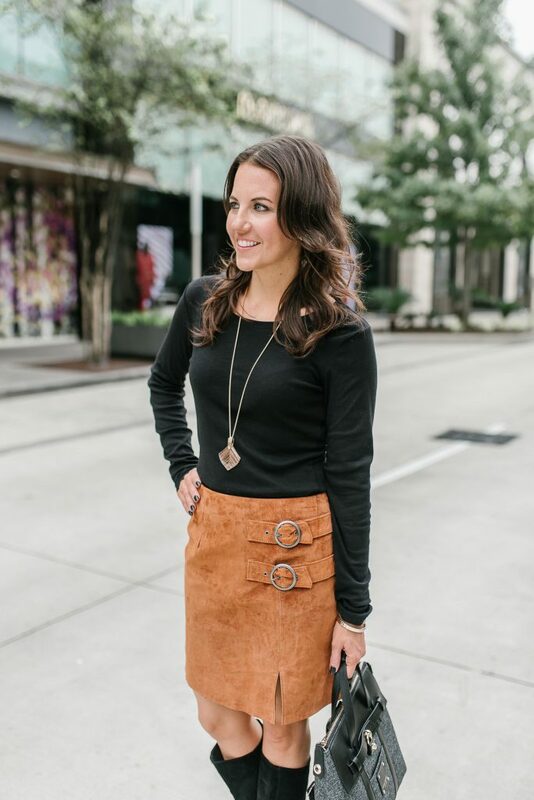 I adore a suede skirt! Love how you styled this one. Oh I do love this skirt. It’s a 70s throwback for me and that is the era that is my favorite to emulate! Such a chick fall look. 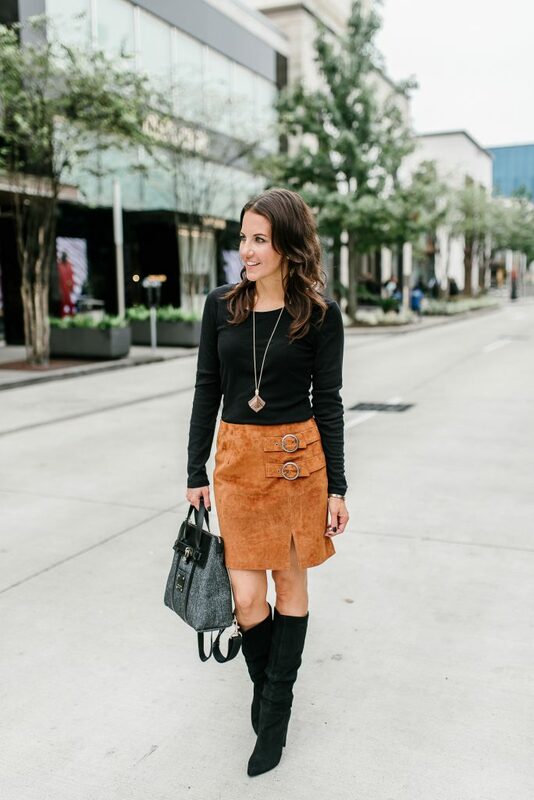 Love the skirt and love the boots. In the market now for a tall high heel boots. Heel height must be 4 inches or higher and round toe for my big feet. Today it’s 80 degrees here in nyc and I am still in summer bikini mode. Off to my girlfriend house pool with boyfriend. Gotta enjoy every last drop of summer before winter arrives. Such a cute look! Love that skirt and bag.